Phycox Joint Supplement Granules For Dogs 960 Grams are an easily administered source of Phycox and can be given to a dog of any size, to support joint mobility and bone structure and relieve inflammation and pain. Phycox Joint Supplement Granules For Dogs 960 Grams are an easily administered source of Phycox and can be given to a dog of any size, to support joint mobility and bone structure and relieve inflammation and pain. These granules are palatable for the vast majority of dogs and can simply be added to the dog's food. In addition to the revolutionary and patented* ingredient Phycox, like all of our products, Phycox Canine Granules contain omega-3 fatty acids, glucosamine, MSM and potent anti-oxidants such as ascorbic acid (vitamin C), selenium and grape seed extract. Phycox Canine Granules are the most cost-effective way to give dogs the benefits of Phycox. Phycox Canine Granules contain negligible amounts of sugar as sucrose (400mg per 4 gram scoop). They are therefore not only healthy overall, but also generally suitable for diabetic dogs, although caretakers should be informed that they should only be used in these patients at the specific recommendation of the animal's veterinarian. Phycox Canine Granules contain the least sucrose of all Phycox canine products, so they should always be the first choice for treating diabetic dogs. 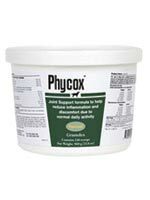 In terms of Phycox content, one 4 gram scoop of Phycox Canine Granules is the equivalent of one Phycox Soft Chew. The granular format makes it easy to appropriately dose dogs of all sizes.